Journal: I woke up at 6:00am and was on the road by 7:20am on a very windy and relatively warm day. 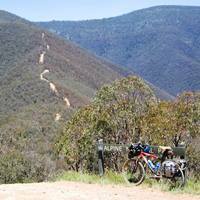 I hoped that a mainly downhill ride would get me to Licola, 45km away, quite quickly. However, the road was quite steep and poor in quality meaning I couldn't go too fast and I got very tired hands from using the brakes the whole way. When I reached the floor of the Wellington River Valley it still took a long time to get to Licola and I was very tired (probably from yesterday) by the time I got there. I found the small store and had an early lunch of pie, pastie, ice-cream, juice and milk. After about an hour I set off towards Woods Point on a road that climbed steadily back into the mountains. I felt quite tired and decided to walk when I felt like it. This meant that progress was relatively slow but it was steady. Nearer the top the road changed to gravel, and after a break, I felt some strength returning nand walked less, making faster progress. I turned off the Jamieson Road towards Woods Point and made good progress until I turned on to the Selma Road which climbed over Mount Selma. The surface was rough and there were plenty of ups. Even coming down the other side I couldn't make good speed because the surface was too poor. I hoped it would be better when I turned on to the Walhalla-Woods Point Road but it wasn't. I had been planning to stop in at Woods Point and perhaps spend the night there. However, as I got closer, the prospect of descending into Woods Point and then starting with the climb out tomorrow morning seemed less enticing. I had enough food to camp out and in the end decided to keep going to a picnic area marked on the map. I seemed to be making good progress and the road was sticking mainly to the ridge. It was much more rainforest-like with tree ferns, etc. I reached the picnic area at 7:00pm but it was a wreck. I continued on another 5km and found a place on a side trail shere I camped. Yet again my chafing was quite bad and my clothes definitely needed a wash. I went to bed at 9:30pm after calling Barb.